Clear Turn makes it easy to give your skin anti-aging spa treatments at home. Biodegradable paper facial mask infused with pure Co-enzyme Q10 and Glycerin essence gives skin moisture, leaving it shiny and looking young in just 5 minutes. Uses deep ocean water to hydrate skin and keep skin soft. Three-layer soft sheet made with environmentally friendly materials holds more liquid and fits curves of your face well. Weakly acidic, no fragrance, no colorant, and no alcohol. .
30 Masks in their own convenient storage container. Made in Japan, comes with English usage instructions and ingredients. 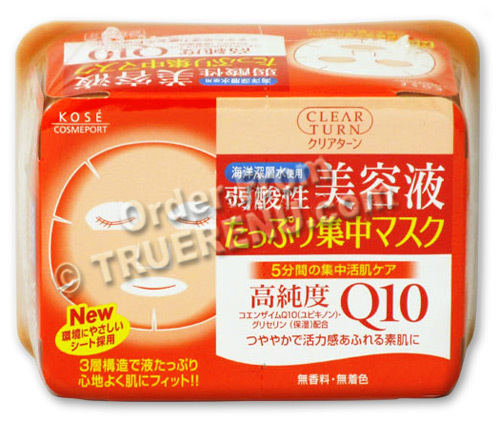 Coenzyme Q10 (CoQ10) is produced by the human body and is necessary for the basic functioning of cells. CoQ10 levels are reported to decrease with age. Each moist sheet has cutouts for eyes, nose and mouth. The soft mask conforms to the shape of your face, hugging the key areas around the eyes, nose and mouth. Carefully remove and open one mask to its full size. Lay over your face, apply slight pressure to the mask around eyes and mouth, then gently push all the air out from mask and face. To treat under eyes, be sure to make contact between the eye cutout area and the skin. Leave the mask untouched for 5-15 minutes, then remove and discard. Remove or massage residue into skin. Follow with normal special care routine, lotion, and makeup. Use 2-3 times a week, or daily in place of toner. Remove contact lenses before use. Ingredients: Water, BG (butylene glycol), alcohol, laminaria japonica (kombu - brown seaweed) extract, ubiquinone (Coenzyme Q10), disodium EDTA, PEG-50 hydrogenated castor oil isostearate, triethyl hexanoine, disodium phosphate, sodium phosphate, phenoxyethanol, methylparaben.